Kevin Baker, contributing editor of Harper's Magazine and last night's guest on The Colbert Report, made a quip about the health care proposal that I felt had bearing on illustration. "...if you don't take the big swing of the wheel, you're going to go right into the ditch." When a drawing isn't looking right, it sometimes takes a dramatic turn in another (or indeed the opposite) direction to put it back on course, vs. many minor adjustments which may or may not help in averting disaster. Today, I hope, will be a day of "big swings of the wheel." 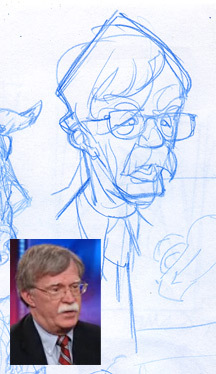 <---unrelated : Here's a doodle of John Bolton, who was on the preceding Daily Show. I like his wooly mustache.